These 16 members of our team were selected to race our 2015 vehicle from Ohio to South Dakota in the 2016 American Solar Challenge. Composed of mechanical, electrical, and aerodynamic engineers, as well as sponsorship, marketing, and operations members, the 2016 race crew carried on our legacy of success in the American race. Shihaab chose Michigan because he wanted to challenge himself to live outside of his comfort zone by pushing himself to go to a college where he didn't know anyone. When he got to Michigan, that approach translated into joining a project team where he had no technical knowledge. Being a part of the construction and US testing of Aurum before leading the team as Interim Project Manager instilled a passion for solar car racing in Shihaab. As Team Leader, that passion drives him to build the best possible team and team culture, in order to establish the University of Michigan Solar Car Team as the world's most successful solar vehicle team. 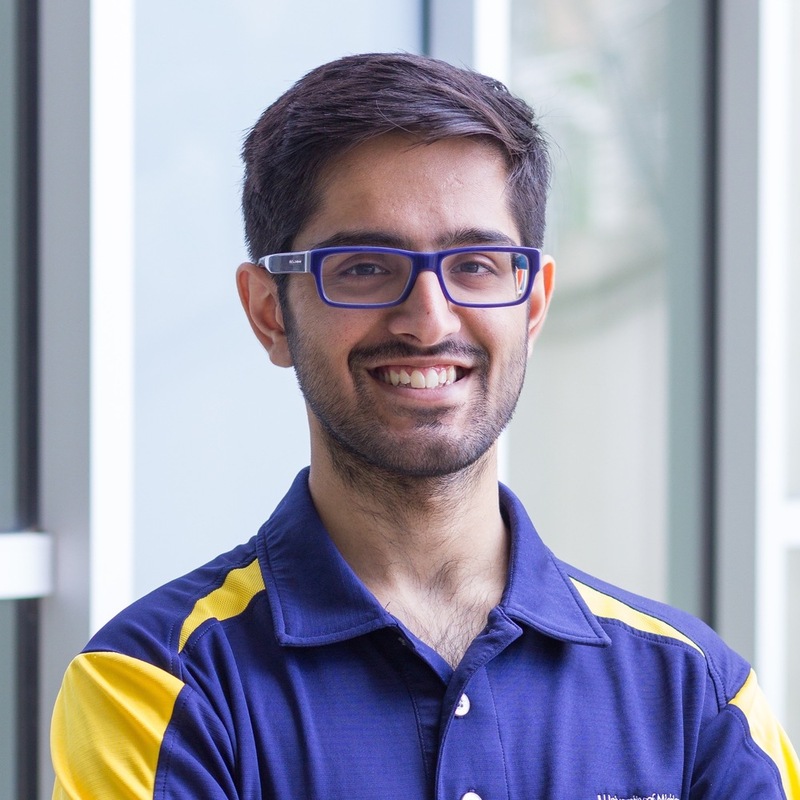 Shihaab is responsible for thinking ahead and providing resources to the team, and for managing all external team relations, including the University of Michigan, team alumni, high-level sponsors, and other teams. His favorite Solar Car memory is watching Aurum drive on the road for the very first time. It was absolutely mind-blowing that the car the team had worked towards was out on the street with people heading to work. This summer, he is most looking forward to seeing the 2016 race crew grow together as people and engineers. 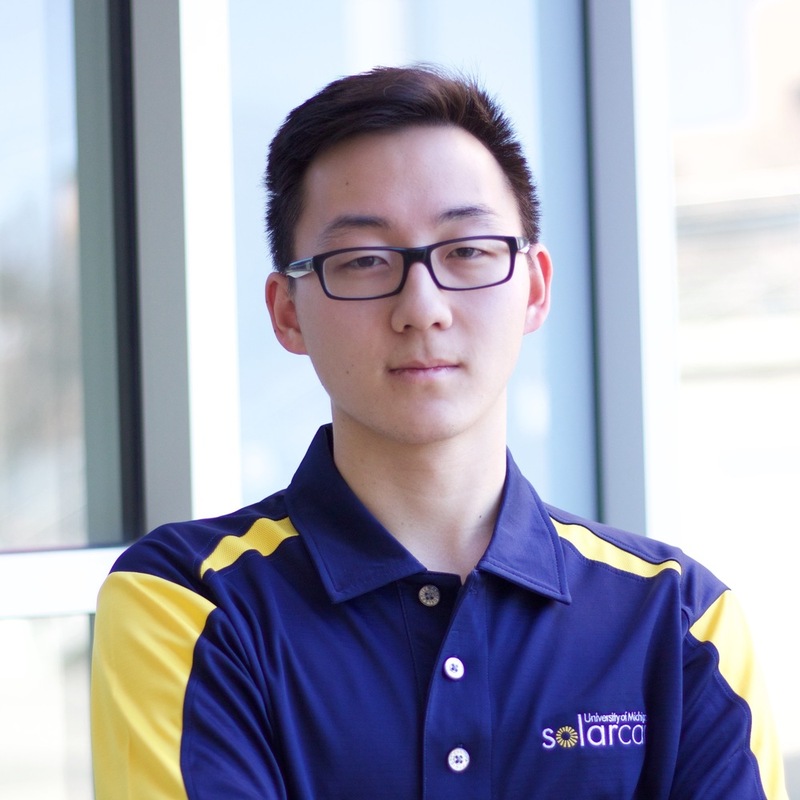 Perry joined the University of Michigan Solar Car Team as a freshman because, after being involved with a variety of STEM competitions in high school, he knew that working on an interesting, competitive multidisciplinary design team was important to him. As Crew Chief, Perry is responsible for the safety and reliability of the vehicle, and the preparedness of the Race Crew. Perry is driven by a passion for what the team does and joint desires to help build the fastest car and the strongest team possible, in order to win the races where we compete. 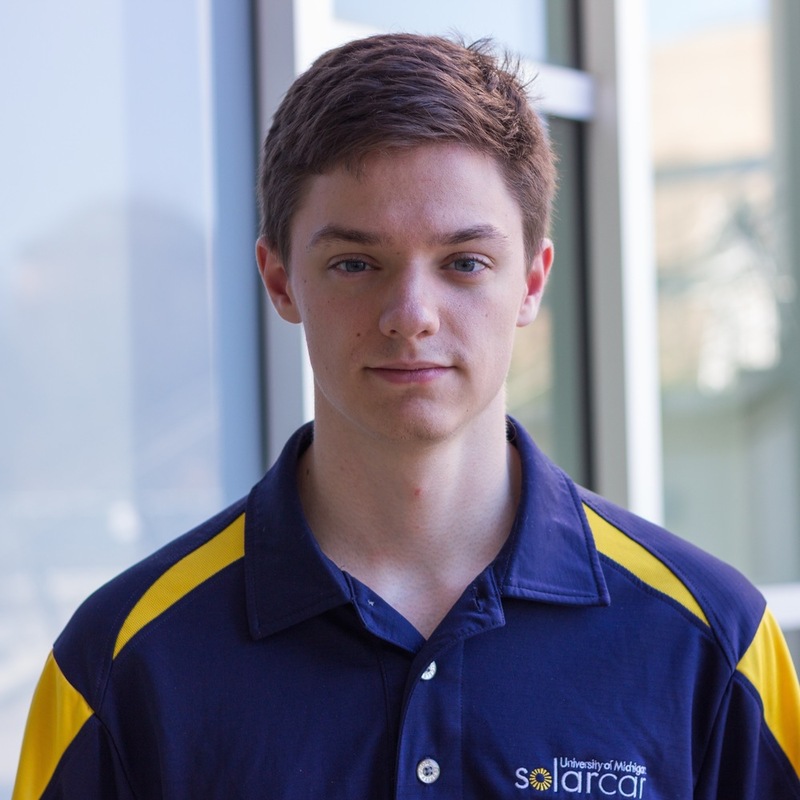 His favorite Solar Car memory so far is finishing WSC 2015 and getting to interact with the other teams in Adelaide. This summer, he’s looking forward to good times with great people and an exceptional car, and to seeing the entire team focused and working together toward a common goal. Clayton 's participation in VEX and FIRST robotics sparked his interest in engineering and design teams. He learned of the team from browsing the university's website, and after taking a look at the other design teams during Festifall, he decided Solar Car was the team for him. Clayton joined race crew to both race Aurum again and start making headway on the 2017 car, to learn and grow from the solar car experience, and to to be part of a passionate group of friends driven toward a common goal. 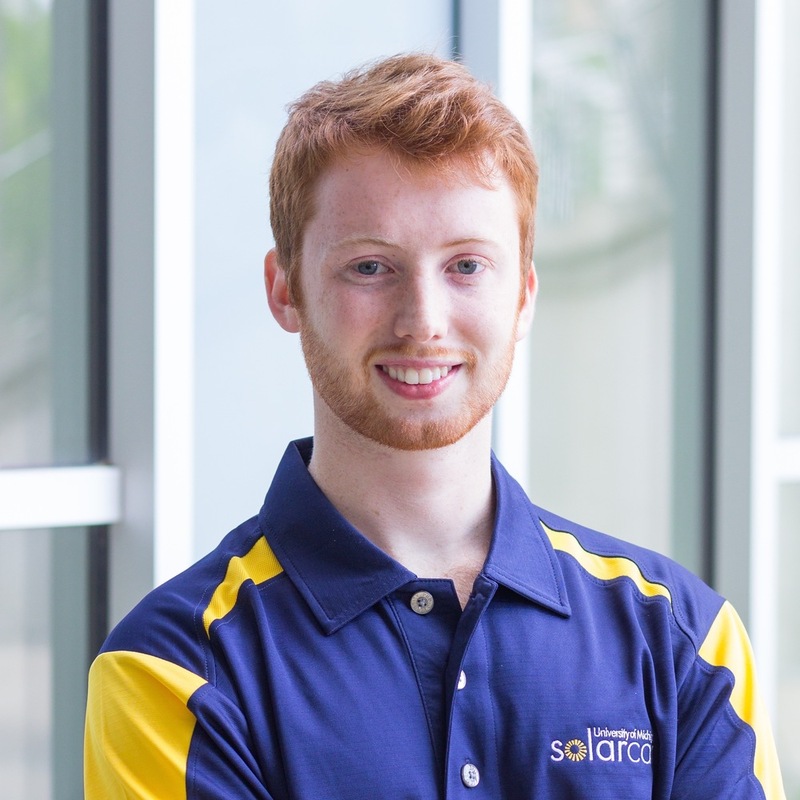 As the 2016-2017 Engineering Director, Clayton is responsible for ensuring the most competitive vehicle is designed and raced in the 2017 World Solar Challenge. His favorite solar car memory so far is jumping into the Victoria Square Fountain at the end of WSC. It was a great sense of relief and accomplishment, and he can’t wait to repeat the experience in 2017. When he's not working on the car, you can find him longboarding through campus. He can also ride a unicycle. 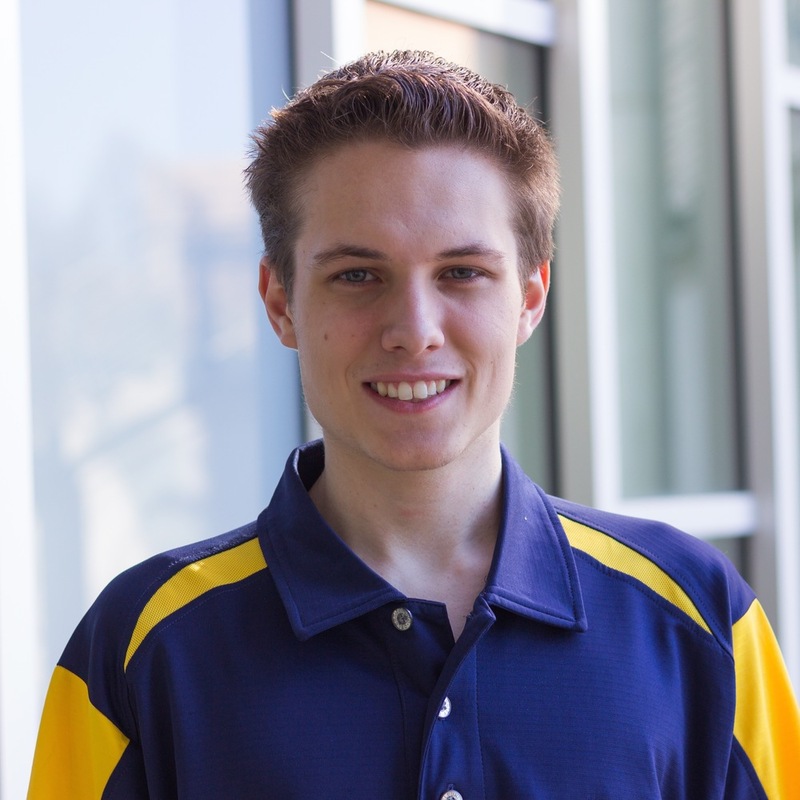 Jonathan knew when he chose Michigan that he wanted to take full advantage of the university’s emphasis on project teams. As a freshman, he decided that solar car was the best fit for him, and has been involved ever since. Jon joined race crew because he wanted to race the car and get the experience of working a dedicated schedule towards a huge engineering project. The more time passed that he was on the team, the more inspired he became by both our team's history and his teammates' drive to work hard and continue that legacy. As Operations Director, Jon focuses on race logistics, team preparation for the American Solar Challenge, and manufacturing or procurement of newly designed components for Aurum. He is most looking forward to working with the 2016 team and seeing them work hard and succeed, not just in this upcoming race, but for many years to come. Sarah first heard about the team's legacy of success and the excitement of racing during a chance encounter with longtime solar car supporter Chuck Hutchins. She joined because having been heavily involved with FIRST robotics in high school, she knew the value of working on a long-term, multidisciplinary project with a passionate and dedicated group of people. She was motivated to join race crew to be a part of the team's legacy and contribute towards its' future, and as Business Director focuses on the satisfaction of current sponsors, forming new corporate partnerships, and marketing the team to potential partners, solar racing fans, and the general public. She is most looking forward to the race and seeing the 2016 race crew come together over the course of the summer, and when she's not thinking about solar car, enjoys spending time with friends and exploring Ann Arbor. 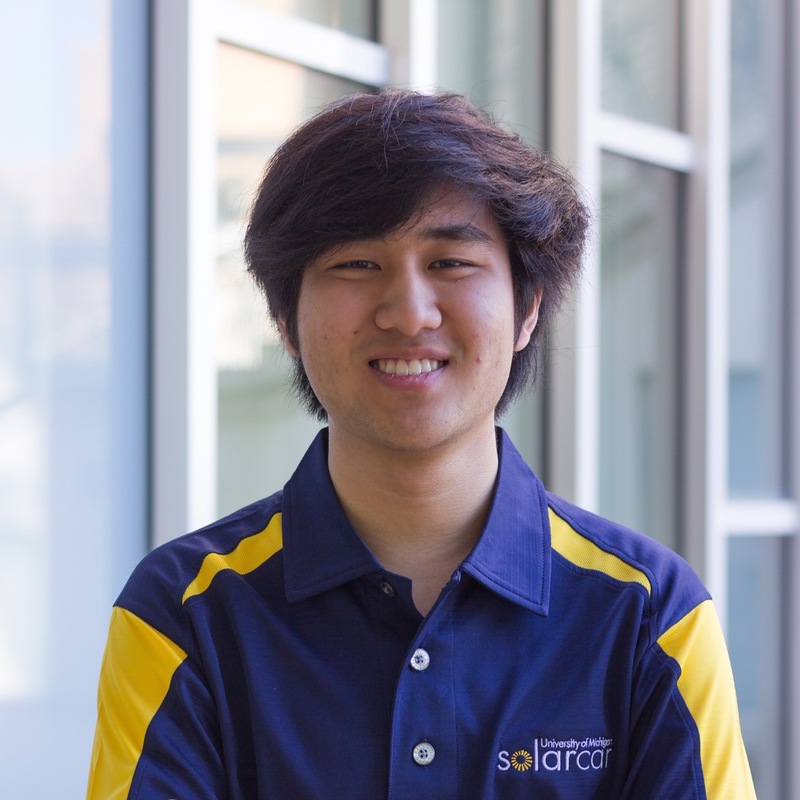 Alan joined the team because he enjoys modelling and simulating physical systems, and solar car offers exactly that for a relatively new concept that has yet to be fully explored. As a math and physics oriented computer scientist, he joined race crew because racing is where his math and physics background comes most in handy. In strategy, much of the semester is spent working on tools, which is relatively removed from mathematics. Alan will be focusing on making sure data gathering tools are up to specifications and on characterizing Aurum for ASC. He's looking forward to analyzing Aurum through characterization tests, but, more so, to just seeing Aurum move by itself. Andrew joined the team because of the student projects teams at U of M, the students on Solar Car seemed the most put together and the most enthused about their excellence. Solar Car's long history of success stood out as something he wanted to be a part of. He says he joined race crew because, "a solar car team is nothing without its race, and I could not in good conscious feel as a member of the solar car team without participating in a race. The stories of old race crews told me of the blood, sweat, and tears that led to friendships that lasted for years and called out to me to join." This summer, Andrew will be working on improvements to Aurum's mechanical systems, primarily brakes and steering, as well as driving the solar car. His favorite memory so far is making a snow fort at the team's spring break retreat. David joined solar car because he thought it was a great opportunity to learn a lot and challenge himself. Similarly, he joined race crew to learn even more than is possible during the regular school year. Beyond the experience that comes with working hands-on with the solar car, he hopes to gain life experience through the high intensity racing environment. As the composites system head, David will be focusing on everything to do with composite components. He's most excited to visit the national parks along the race route, and when he's not at solar car enjoys finding new places to eat, playing basketball, and watching movies. Hossein is an aerodynamics engineer on the team who was drawn to solar car because he always drew unique cars and air planes in his youth, and has enjoyed designing vehicles ever since. He joined race crew because he wants to challenge and push himself more as a member of the team, with the overall motivation of winning the 2017 World Solar Challenge. This summer, he is splitting time between serving as a mechanical member of race crew, modifying Aurum to fit the ASC "crush zone" requirement, and performing aerodynamic analysis oriented towards possible 2017 vehicle designs. Jesse transferred to Michigan this past fall and joined Solar Car to get more involved with the University, be a part of a team, and gain hands-on experience outside of the classroom. This summer, he will be heading up materials sourcing and parts manufacturing for the team. Jesse is most looking forward to getting Aurum out driving on public roads this summer. Karthik joined solar car because he saw it as a way to get hands-on engineering experience and actually "learn-by-doing". Subsequently, he joined race crew so to learn more about the inner workings of the team, as well as become more involved with the design process. Karthik will be working on the micro side of electrical this summer, and is most looking forward to competing in his first race and getting to know the team along the way. 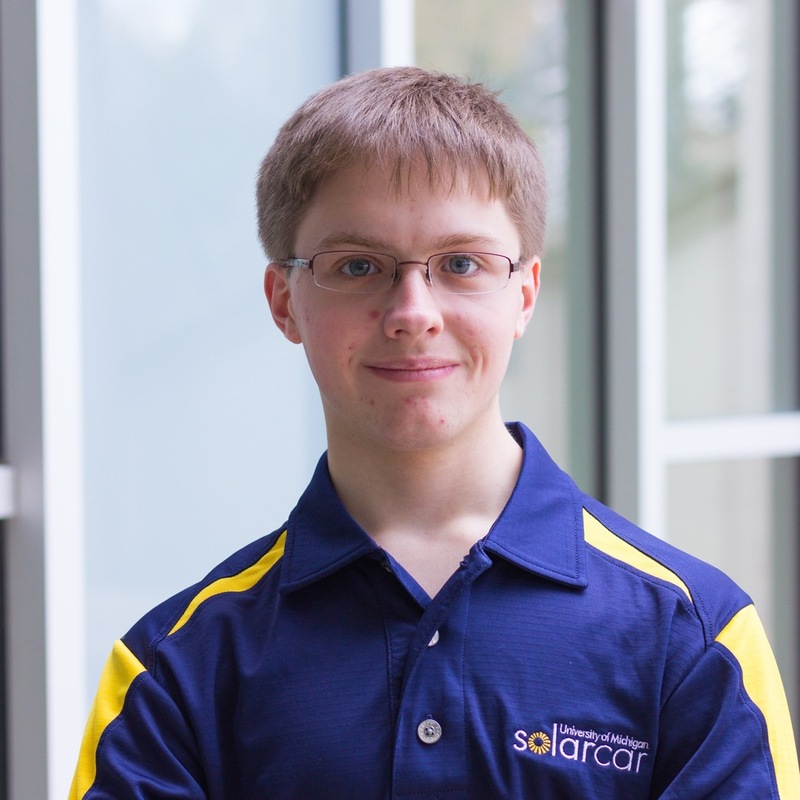 Lucas came to the team after bring interested in joining since high school, because he thought Solar Car was a very cool way to gain practical experience in the fields of electrical and computer engineering. After becoming very interested and involved in everything about the team, he joined race crew because it seemed like the natural next step. He also wanted to be a part of the race so that he could see the goal that his hard work went towards. Currently, Lucas is the the high voltage system lead, and focuses primarily on the battery and motor of the car; he intends to continue to focus on these, but also wants to broaden his experience with all systems of the car. He is most looking forward to the race, as well as to being a part of all of the testing the team will conduct this summer. Lucas also bakes excellent chocolate chip cookies, and in his free time enjoys camping and fishing. Matthew joined solar car because of his interest in solar energy; he believes that solar is the future, and wants learn as much as possible about its applications. Subsequently, he joined race crew to get the full solar car experience and to really know what this team is about, and is motivated to race because he has always loved competition. Matt is a member of the mechanical division, and has been focusing on improvements to the cars' aerodynamics. He is most looking forward to racing Aurum and seeing all of this summers' work in action. Michael joined Solar Car because it combined his interest in renewable energy with the excitement that comes with internationally competitive racing. Joining race crew, he says, "was kind of a no-brainer;" it seemed the most effective way to make a real impact on the success of the team and the car. Michael works on the car's high voltage electrical systems, which includes everything from making spares to researching methods of boosting power output from the array. He's most looking forward to our first mock race, which he imagines will be pretty funny when the team isn't being stone-faced serious during the actual racing. Michael also overcame his incorrect assumption that you cannot learn how to whistle, and in his free time enjoys browsing the internet, watching Netflix, and listening to music. Mitchell joined the team back in 2013, because he was impressed that the solar car could go so fast on so little energy. He originally heard about the project in high school, and even then hoped to be on the team. Mitch joined race crew because he had previous race experience, and knew what to expect from the summer's work - a good challenge working on a novel systems that, while tough, would be worth it. When he first started working on the team, Mitch worked on the operations division. He raced ASC 2014 as a race mechanical, and last year worked on designs for Aurum's dynamics and chassis analysis. Currently, he is a senior planning on spending more time on his major in the coming year, with the intention of graduating in December 2016. One of his favorite solar car memories is the generosity of the churches that support the team on race and mock race. 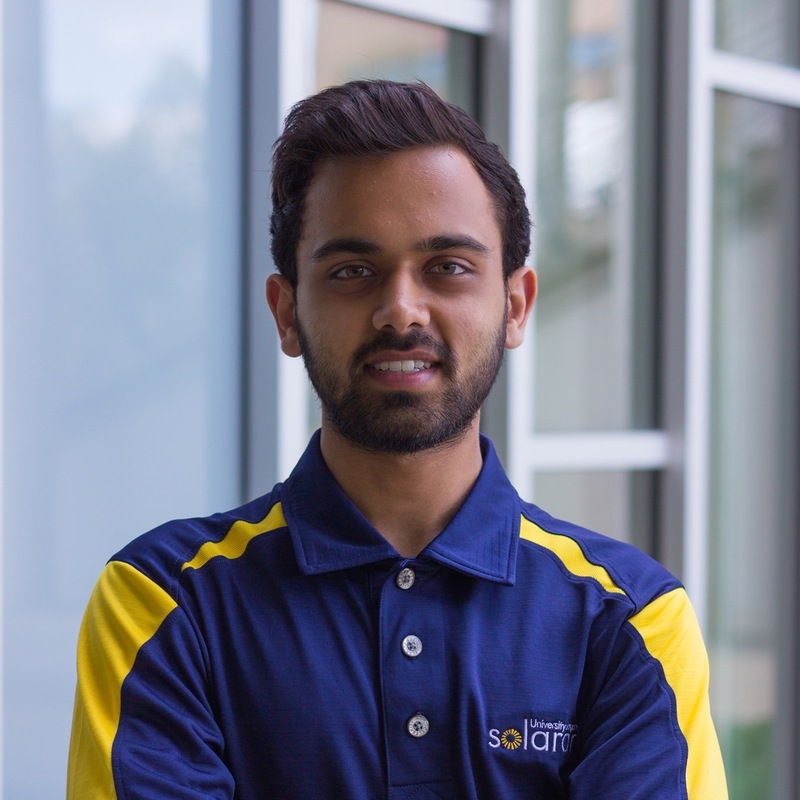 Shyam Thakkar joined solar car because he wanted to be a part of the best solar car team in America, and because he wanted to learn as much as possible about solar power and how the many components of a car come together. Shyam mainly focuses on the micro systems of the car, including, but not limited to, pcb boards and coding for the steering wheel. He is most excited to finally get that racing experience that he's heard so much about and experiencing the drive that only comes from being part of an actual race team. Shyam also boxed for 2 years in high school, and when he's not doing solar car enjoys exploring, studying, climbing, and dancing. 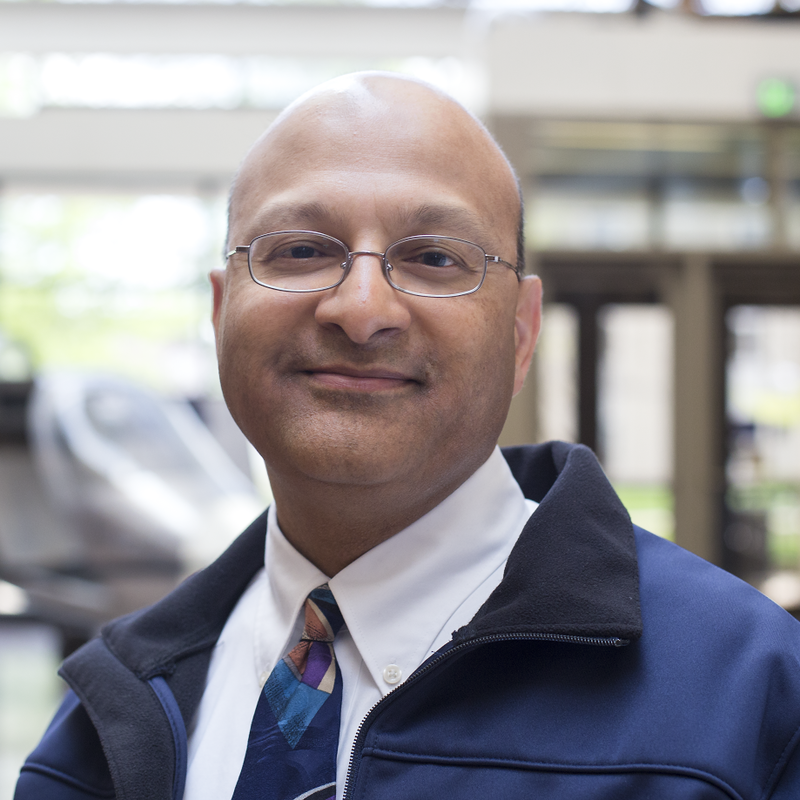 Neil Dasgupta is an Assistant Professor in the Department of Mechanical Engineering at the University of Michigan, and faculty advisor of the UM Solar Car Team. He earned his Ph.D. from Stanford University in 2011. Prior to joining University of Michigan in 2014, he was a postdoctoral fellow at the University of California, Berkeley. He is the recipient of a U. S. Department of Energy EERE Postdoctoral Research Award (SunShot Fellowship), the AVS Student Award for Best Graduate Research in ALD, and a Stanford Graduate Fellowship. His research focuses on the intersection of nanotechnology, manufacturing, and energy conversion.